every one I saw gave the idea two thumbs down !! Some even used naughty words ! said "who does this guy think he is ... the next Rob Muzzy ??? cause a debate about my sanity for saying all this. Take Action And Do It !! That's what Power News is all about !! I've won at this sport for 10 years, and I'm now turning the Power over to YOU !! So let the e-mails come pouring in !! Hey Moto Man .... It Works in Netherlands ! This is LEMSTRA RACING in Netherlands. We have tuned two Kawasaki ZX6R's with, 01 works racing kit, adjustable ignition (mapping per 250 revs), and we tuned one with ports like you described at 65% smaller and we went from 110 rear wheel bhp to 115.6! Thanks and greetings from Alkmaar, Holland ! That's waaay cool that you hi - velocity ported your cylinder head !! You're the first person to use Power News porting techniques and e-mail your results !! The "out of the box" people will always make the fastest bikes !! Congratulations & please tell everyone in Netherlands to sign up for Power News !! Hey Moto Man .... It Works in France, Hungary, Norway, Sweden & Netherlands ! First of all: Power News is AMAZING !!! I wanted to tell you that Norway's Kai Børre Andersen won 3 rounds of the European Supersport Championship !! And he's winning here in Scandinavia too. Even Valentino Rossi was cheering for him as he crossed the finish line to win in Netherlands !! His bike seems very fast ... undraftable actually. 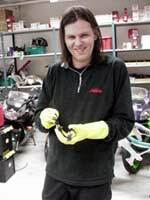 His Yamaha R6 engine was built by Jørgen Johnsen of Fast Bikes shop here in Oslo. The rumor is that the intake ports are smaller than original. Keep up the great Power News series !! ~ Øyvind ( Norway) Hi Øyvind ! The rumor is true ! I've been working together with Jørgen to develop smaller ports since 1993. Jørgen's Yamaha R6 engine set-up features intake ports that choke down to 65% of the intake valve diameter. Jørgen's motors are among the fastest on the planet, and Kai Børre is riding the wheels off the bike ... it's a great combination !! Please tell everyone in Norway to sign up for Power News !! on their Euro Supersport 600 wins !! Hey Moto Man .... It Works in the UK !! I have read your article on reduction porting with great interest! I have been steadily decreasing the size of the Yamaha R6 port and watching the power steadily rise ! inlet valve at the choke point. I have now gone down to the 65 % you suggested, and got even more power !! What else can I say ??? Oh yeah, please tell everyone in the UK to sign up for Power News !! Just for your information, I was in Jan Roelof's (Netherlands) workplace a few weeks back and saw that he was filling in the inlet tracts just as you describe in Power News. I saw a couple of R6 heads and a XT660 head with filled in inlet tracts, & some with preparations to do so. His R6's where measured with the highest top speed at the Philip Island Australia World Supersport race this year. ~ John (Netherlands) Hi John ! Thanks for the info ! I always thought that Jan Roelof is one of the best tuners in the world. And now we know ... It Works in Australia Too ! A fellow Water Cooled GSXR rider sent me over here to Mototune USA. First I want to say thanks for sharing some of the secrets, Power News has been some great reading. I have a 1993 GSXR 750 with Stock internals and no porting what so ever, I have added the following bolt ons: WebCams 352 Cams, Keihin 39mm Flatslide Carbs and a Yosh full Race Duplex system. From what others have said I am looking at roughly 125 RWHP Not bad for a 9 year old bike. I would like to hit 130RWHP without a BIG Bore Kit do you think your "reduction porting " will work on an older bike like mine ?? Yes, smaller ports will work "awesome" on your bike !! In 1994, Jørgen [the same Jørgen as in the 2nd letter] and I developed the intake ports for Suzuki Norway's Jan Olav Noteng. That year Jan Olav qualified within a couple tenths of a second of Factory Suzuki rider Herve Moneau at a World Superbike race ... with smaller ports. No one could figure out why that bike was so fast ... now you know !! Wow !! Please tell everyone in the USA to sign up for Power News !! I have been reading with interest your work on the high velocity ports I have a zx11 with 1137cc cosworth piston kit, yosh cams, flatslides, etc and last year was making 175 hp. Over the winter 1 mm oversize inlets valves were fitted, with the ports opened out the same, and compression increased from 12.5-1 to 13.1-1, and I have struggled to 173 hp now. 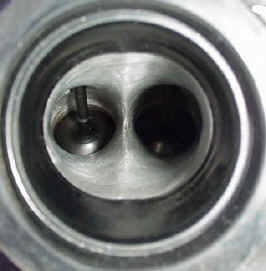 Have you carried out high velocity port work on the zx11 head, and would you still expect to get the same results ?? The "problem" with the ZX11 cylinder head, is that it's flow can be increased tremendously over stock. More so than any modern head I've come across. This creates a situation where flow porters get a real adrenaline rush when they hook up the head to the flow bench ! I believe that energy isn't lost, it just goes somewhere else. In this case the adrenaline gain experienced by the head porter, is approximately equal to the amount of adrenaline loss the rider experiences when he rides his newly flow-ported bike. The good news is the loss is temporary !! You'll gain lots more power (and recover your lost adrenaline) by reducing the port size of your Kawi as shown in Power News ! At the beginning of the twentieth century, everybody "knew" that a heavier-than-air machine couldn't possibly fly. It would violate the "laws" of physics. All of the "experts" said so. and today we take airplanes for granted !! the "out of the box" thinkers !!! What About 2 Valve Heads ??? and older Japanese engines which use just 1 intake valve. Please understand that this would be an experiment, as I've never done it myself. dyno test High Velocity Porting !! of racing technology for 1999. The World Supersport Victor !! MotoMan's Wimpy Little Port !! As you can see, I was surprised to find out that the ports were bigger than stock !! "The Box" started to close in all around me, and I felt the familiar "fear adrenaline" surge as we drove to the dyno test. This head was ported by the best in the world, and was a winner on the racetrack. Now I had to face the music !! My customer would be really mad if we ended up losing power after coming all the way over there !! What if I've told my 8,709 friends who've subscribed to Power News a bunch of hogwash ??? MotoMan was really up against the wall now, with nowhere to run & hide !!! Beads of sweat appeared on my forehead !! What happens when you decide to high velocity port your cylinder head ??? 1) You think out of the box !! 3) Truth (reality) is often regulated for a variety of reasons. 4) You personally have a lot more power than you may have previously realized. but you've got to be able to get out of the box to see it. 6) Information on "the internet" can't automatically be discredited because of the silly "dot-com" phenomenon. 7) Power News does in fact ... ROCK !! 8) Oh yeah, I almost forgot ... your engine will suddenly become really, really fast !! Like the many layers of an onion, after breaking out of one box, look hard enough, and you'll find a new one. Some boxes are built more solidly than others, but with practice, one day you'll find that all the walls will fall quite easily.
" Little Exhaust Ports "
... Of A 126 HP Yamaha R6 !! This is the work of someone I have a lot of respect for !! 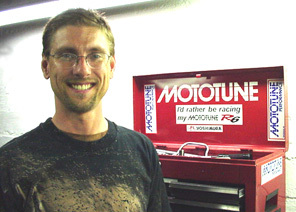 I'm talking about none-other than Jørgen Johnsen from Fast Bikes shop in Oslo, Norway !! Jørgen's mixin' up another batch of epoxy !!! Nope, I didn't come up with this idea ... it's all Jørgen's !!! The blue clay represents the area which will be carefully welded up to create supersonic velocity !! The intentional flat face of the "D" shape reduces backflow, which contaminates the mixture. 2 - 3 more HP on the Yamaha R6 !! If the idea is to reduce exhaust pumping losses, and that means increasing "flow", how can this possibly work ?? The exhaust must be completely cleared from the cylinder. 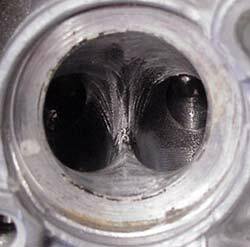 The only way to accomplish this, is to open the exhaust valves about 30-40 degrees before the bottom of the power stroke, so that the still burning charges pressure can begin to escape out of the cylinder. If the power phase were allowed to continue to the bottom of the piston stroke, the piston would have to work hard to push against the high pressure created by the still burning (and still expanding) gasses during the upward exhaust stroke. Instead, some of it's own pressure is used to blow itself out of the cylinder while the piston is still on the down stroke. By the time the piston reverses direction in the exhaust return phase, the excess pressure is gone. If the exhaust silencer is positioned as shown in the Dynamic Horsepower newsletter, there will be a slight vacuum which will actually pull the piston up !! The "textbook 4 stroke" had positive pressure during the exhaust return phase, whereas I'm saying there is vacuum !! Which one makes more sense ?? the flow's maximum velocity pulls the exhaust gasses out after the bottom of the power stroke. 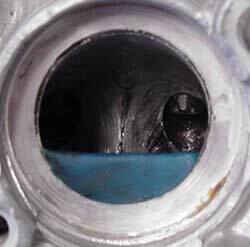 When this happens, the piston is actually pulled up for the exhaust return stroke !!! It's not 100% "free power", because the energy comes from the last of the expanding gasses from the power stroke. But, it turns out that this tradeoff of energy results in more power gained through using the gasses to pull out the exhaust than to use them for a longer power phase. make the exhaust stroke effectively into a mini 2nd "power stroke" !!! Call it the "Power Upstroke" !!! On the flow bench, these "Mach 1" exhaust ports really "scream" and ear plugs are required !!
" It's A Screamer !! " They're so dog-gone awesome, that I buy everything they are trying to sell me !! when ever I go on the internet !! Some motorcycle websites even have them now .... coooool !! Wow, I just get so impressed by those, and they really make me like the people who are delivering them to me so much that I just want to buy all their products !! So, how can you stop those fruity - tooty pop-ups ??? As soon as one of those yucky buggers starts to load, just click "Control" and "W"
on your keyboard to send it back under the cyber-rock it crawled out from !!! 100% Out Of Control Pop-Up Page !! Try it a couple times .... it's actually fun !! ... don't worry, except for this there will never be pop-ups on Mototune USA !! That's No Joke Folks !!! "Football - NASCAR - Professional Wrestling - Like Status !! " That's what I'm talkin' about !!! Power News reader and AFM racer JD Grow told his former high auto shop teacher about Power News. Dave liked it so much that I was invited to do a seminar for his class !! Mr. Backman made a video set-up that allows close up work to be seen by the entire class. Here, the students are glued to the TV screen as they learn to make intake ports smaller !! McKinleyville High School's auto class ROCKS !! A Power News "Report Card" From Mr. Dave Backman !!
" Thank you so much for presenting your Power News seminar to my automotive classes at McKinleyville High School. Your presentation helped me in my quest to teach my students "how to think" rather than "what to think". The week after your presentation I was impressed by the higher level questions my students were asking and the comments they were making. It was clear that they were thinking “out of the box” and questioning conventional thought. The best way to think outside the box is to first understand why we think inside the box. It is important that we not corrupt the basic instincts of “cause and effect” that thinking outside the box needs, but teach students to understand technical and mechanical concepts that question theories set by others. An understanding of the basics of theoretical concepts is critical to the learning process. You helped me accomplish this with your presentation to my classes. Your analytical mind, your natural inquisitiveness of things mechanical, coupled with your practical and logical thought processes, has developed you into an “outside the box” thinker. I cannot thank you enough for your visit to my class, I am looking forward to your return. Power News is the best !! " The students stuck around, and asked lots of questions, even after the bell rang for the end of class !! This Is The Start of Something Really Big !!! new energy going in the classroom discussions !! Do you belong to an email list or forum ?? The Power Behind Power News ... Budweiser !!
" 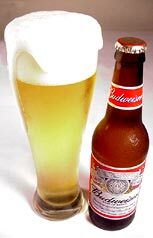 Switch To Budweiser !! " More Power Behind Power News ... Battery Energy Drink !! It Keeps You Going !! P O W E R V O T E !! Who Do You Think Won The Test ?? Attention 2002 Yamaha R1 Owners !! Your handlebars may not be tightened properly ! Please double check your handlebars & make sure that your bike is safe ! !